Fructose and Sucrose. Strawberry and granulated sugar. These days, sugar gets a bad rap. Sugar, however, its a natural part of life and what our bodies live off of every single day. There are many different forms of sugar, or carbohydrates, that occur in the world. The sugar that we use for energy is called glucose. Everything we eat eventually gets converted to glucose to give our body energy to function. However, the foods that we usually eat don’t occur as glucose. For example, fruit contains fructose, milk contains lactose, malt contains maltose. When looking at ingredients, words that end in -ose or contain the word ‘syrup’ will generally be a sugar. Since sugar or carbohydrates are necessary for human digestion, there’s no reason to avoid them. However, it is important not to have too much of it. Unfortunately, in today’s society, it’s a little more difficult to watch out for. Processed and fast foods are all around us and readily available anywhere we go. These processed foods generally contain loads of hidden added sugar. Why do you think most commercially produced breakfast cereals tastes so good?! Manufacturers hide these sugars in the ingredients lists with unrecognizable names such as dextrose or sucrose. They also might have names that deceive you into thinking they are natural or healthy sugars, such as corn syrup, molasses, beet sugar, or rice syrups just to name a few. 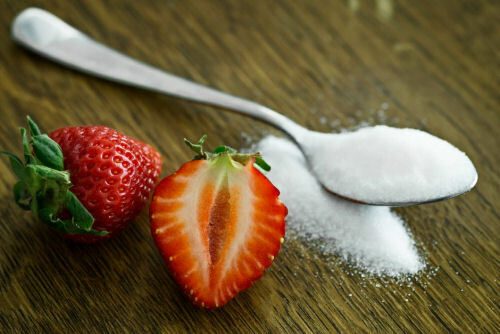 These are highly processed sugars that, according to research, can lead to weight gain and diseases such as type 2 diabetes, atherosclerosis (plaque build-up in arteries), high cholesterol and heart diseases. Processed sugars are refined and modified, and serve as empty calories, meaning they don’t add any nutritional benefits or carry any nutrients. Carbohydrates are found in most foods including fruits, vegetables and grains. A carbohydrate contains 4 calories per gram (proteins also contain 4 calories per gram, while fats contain 9 calories per gram). Carbohydrates can serve between 30-50% of your daily calories every day depending on one’s diet. However, added sugars found in candies and processed foods are different since they don’t serve a nutritional purpose and should be limited. Some health agencies recommend limiting your added sugar intake to 50 grams, or 10% of your calories per day. However, it is possible to consume a lot less or avoid it completely. Most people who have taken added sugar out of their diet have said to feeling more energized, healthier and slimmer. While eating fruits and vegetables is important in one’s diet, there is such thing as too much. Some fruits contain a lot of sugar, which can spike your blood sugar levels and make you feel tired, cranky or moody when it crashes again moments later. A banana, for example, contain about 16 grams of sugar and when consumed on an empty stomach can make your blood sugar spike. Try eating it with some protein or healthy fats, such as a sugar-free nut butter, to control the rise of your blood sugar. Juices are also something to be careful for. While juices can contain healthy nutrients and vitamins, they are also very concentrated with sugar (commercial products usually also have added sugar). A normal serving size is only 4 fluid ounces, or half of a cup! With apple juice, that’s already 11 grams of sugar. In my opinion you’re better off eating an apple since you’ll get the benefits of the fibre with the same amount of sugar and nutrients.